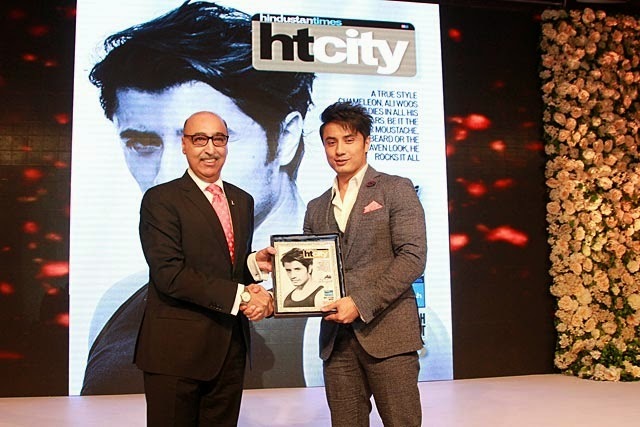 Ali Zafar who recently got "The Most Stylish Import" award in Mumbai, once again shone at Hindustan Times Delhi’s Most Stylish 2015, the biggest style awards in India. Dressed impeccably in a blue Hugo Boss suit, the actor was presented "Delhi's Most Stylish Import" award by the Pakistani High Commissioner to India, Mr. Abdul Basit. While giving his award speech, the actor confessed that it was an extremely important day for him, only because he shaved after a long time. This sent the audience in splits. He entertained the guests at the ceremony as he strummed his guitar and sang, and even got actor Priyanka Chopra, who won India's Style Icon, female, to hum a few lines with him. Other winners of the night were Bollywood actors Arjun Kapoor, Anil Kapoor, Akshay Kumar, Jacqueline Fernandes, Priyanka Chopra, designer Manish Malhotra, Gaurav Gupta and few important names from the fields of politics, media and human rights.